New. 1684222230 Special order direct from the distributor. New. 1609441303 Brand New! No Remainder Marks or Worn Dirty Overstocks! Very Good Soft cover. Clean text--NO writing, NO highlighting to text. Very Good condition. This book was written in the late 1920s and published in the early 1930s. It is no less relevant, insightful and true today than it was then. The idea of the role of education is analyzed and applied from a sociological, political economy and historical perspectives. By defining the role and the nature of education, the author then sets out to analyze apply that definition to the experience of American-born Africans in the U.S. social context. Dr. Woodson may not be well known to the general public despite his distinctions such as being the second African American to graduate from Harvard University with a Ph.D. (the first being Dr. DuBois) and being the founder of the observance of Black History. But he is no less important to American history and his work no less significant for it. Must reading for thinking individuals. 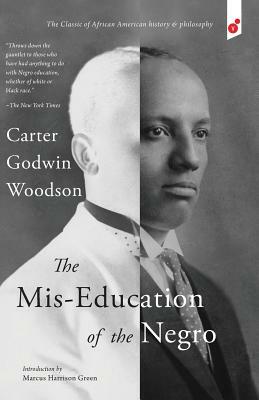 Woodson's views on the experience of African-Americans in our eductional system are helpful to educators up to a point. Some of his ideas, because they were based on the cultural millieu of the early 20th century, are outdated, even archaic. However, there are many ideas that are relevant today...perhaps more relevant than they were originally. The overall thesis, that a Euro-centric education does little to provide African- American children with the necesary skills, mind-sets, and self-esteem necessary for personal success in almost all areas of life is something, I think, that to a degree is borne out today when you look at the high percentage of black youth who do not graduate, are unwed monthers, are in jail, etc.etc. Something is indeed "rotten" when our education fails so many, so often. A book worth reading and pondering, epecially for educators.